RHEM 2 is an intricate pure-puzzle first person adventure game, and the sequel to the popular RHEM. Made for PC and Mac by a 1-person development team, RHEM 2 rejoins Zetais and Kales as they now explore a hidden city far beneath the earth’s surface. Like its predecessor, RHEM 2 features non-linear gameplay, non-violent story, and mind-bending puzzles. The game is set as a direct sequel in story and gameplay to RHEM. Having discovered entry to a hidden underground city, you will venture ever deeper as you explore a maze of clandestine caves, secret rooms, and intricate walkways, tunnels and water systems. As you marvel at beautifully detailed environments and solve clever puzzles, you must search for an enigmatic artifact that must be found and photographed before you return to the surface. Rhem 2 is an adventure that relies heavily on solving puzzles to advance the story. The majority of the interaction entails working with electrical cables which will ultimately restore power to the various parts of the world. Players will encounter logic and mechanical puzzles, those dependent on colors or numbers as well as an open/close door maze-like puzzle. Manipulation of some puzzles requires locating specific clues about them in other parts of the underground caves. 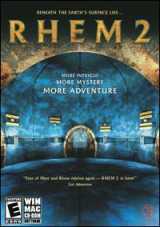 RHEM II SE - The Cave Special Edition (Oct/2018) expands the huge world of the original RHEM 2 by a new unseen area with many new puzzles and challenges. The additional goal is to find one quarter of a medaillion that you may need in the exploration of the upcoming RHEM V.